Art Deco (/ˌɑrt ˈdɛkoʊ/), or Deco, is an influential visual arts design style that first appeared in France just before World War I and began flourishing internationally in the 1920s, 1930s and 1940s before its popularity waned after World War II. It took its name, short for Arts Décoratifs, from the Exposition Internationale des Arts Décoratifs et Industriels Modernes (International Exposition of Modern Decorative and Industrial Arts) held in Paris in 1925. It is an eclectic style that combines traditional craft motifs with Machine Age imagery and materials. The style is often characterized by rich colours, bold geometric shapes and lavish ornamentation. That’s what art deco is. While I was slightly familiar with the style, it isn’t something that I am well versed in. Fortunately, the designers for The Challenge are. Almost everything in my photo comes from this monthly event. While art deco may not be everybody’s style, there are certainly plenty of items available at this event that can blend into any style. The bistro set from [ht:home] would fit right in to a cafe or on a patio. The picture frame and clock from *Atomic Faery* allow you to change the photo, so they are perfect for displaying your own artwork or portraits. 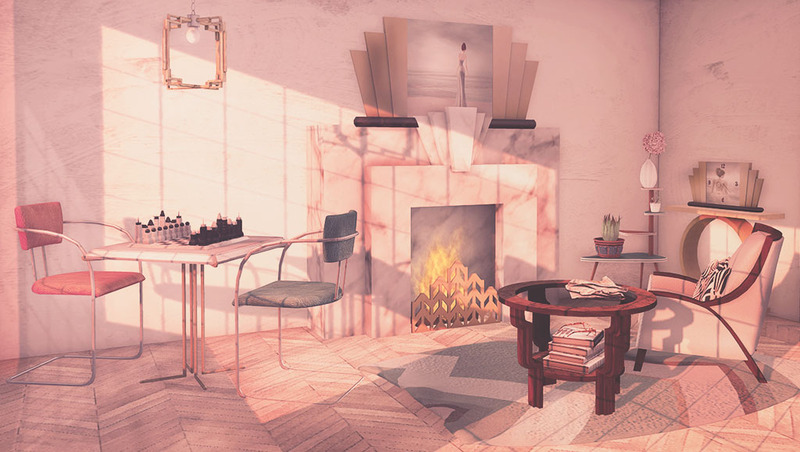 The comfy chair from 22769 ~ [bauwerk] would complement a cozy reading corner and the plant stand (in three different shapes) from Little Llama comes not only in a true art deco version, but in a white version as well, which you can recolour to fit any decor. Truly art deco is an eclectic style; every home decorator’s dream come true.